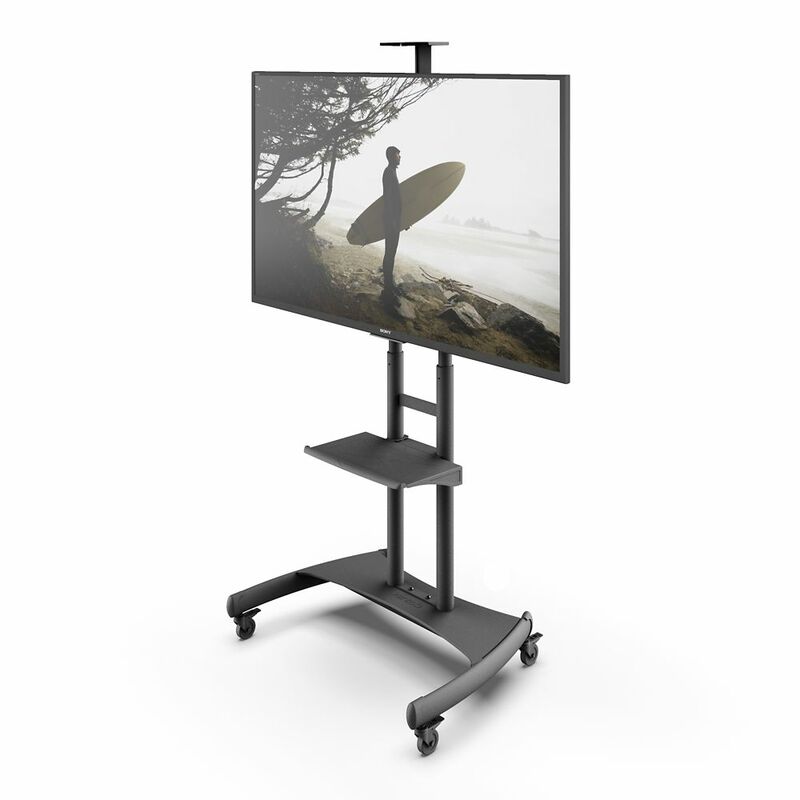 The PS200 is a single stud articulating mount designed to mount most flat panel TVs from 26 inch to 60 inch. It will hold TVs weighing up to 88 pounds, and offers extension, tilt and swivel capabilities to provide you with a wide range of viewing positions, yet sit close to the wall when pushed back. Solid steel construction, attractive detailing and a durable powder coated finish make this mount a great addition to your home or office. An integrated cable management system allows you to route your cables quickly and easily and simple covers finish off the look! MTM82PL Mobile TV Mount with Adjustable Shelf for 50-inch to 82-inch TVs The MTM82PL provides a safe way of maneuvering your TV around any home or office setting. Its steel frame is quick to assemble and features 3-inch rubber casters to smoothly roll it between locations. Along with a top shelf suitable for a webcam, the MTM82PL includes a height-adjustable plastic tray to conveniently carry your laptop, PVR, or other digital devices. It also features telescopic center columns that offer 20 inch of height adjustment and include integrated cable management for an exceptionally tidy setup. To ensure your TV and accessories remain secure, each wheel includes a quick release lock that can be easily applied and released with your foot. MTM82PL Mobile TV Mount with Adjustable Shelf for 50-inch to 82-inch TVs is rated 4.4 out of 5 by 5. Rated 5 out of 5 by Keith from Easy to assemble and very sturdy!... Easy to assemble and very sturdy! Rated 4 out of 5 by Ronb from Overall pretty good experience but not five star. The... Overall pretty good experience but not five star. The estimated delivery date changed several times but ultimately, it was pretty close to original estimate. The box looked pretty rough when it arrived and the parts inside were jumbled. one of the leg extension tubes was damaged and there were minor scuffs on the other. Kanto provided a replacement part quickly which required disassembly to install. The stand itself is very solid and functional and I believe it will serve the intended function well. Good equipment but a little too much drama. Rated 4 out of 5 by DLA from There was a screw that was supposed to unscrew and... There was a screw that was supposed to unscrew and then be put back in place to lock the flat screen to the stand. That screw was immovable and resulted in having to use pliers to bend the small metal barrier it secured so that the TV could be mounted. Afrustrating challenge caused by a defect. Rated 5 out of 5 by Ladybug12 from Pleasent Surprise It is made of strong material & heavy but still easy to assemble for a woman all I needed was assistance with lifting the large flat screen onto the stand. Rated 4 out of 5 by fhunsber from Better Media Cart I've bought the smaller version of this and thought they were good for the price. We bought this for a 75" display and have found it addresses all the short comings of the smaller unit. It has larger casters and a metal accessory shelf (not flimsy plastic!) my only complaint is the cart doesn't track straight so can be a challenge moving the 75" display into elevators and through doors with one person.